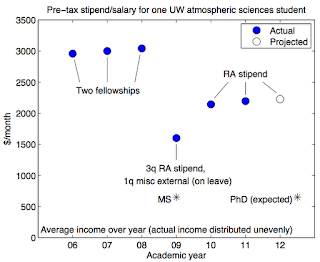 Fees are increasing at the Grand 'ol UW, same as every institution it seems, and along with it the ire of every graduate student in America. This year my institution will require approximately one entire week of pay per quarter in fees. This must be paid in full by about the 3rd week of the quarter. Despite my being paid from a grant, which covers my salary and tuition costs, the fees must come from my own pocket. This totals almost a month of pay per year given to the University, simply for the pleasure being employed here and signing up for 10 credits of "independent research" each quarter. Unlike some of my constituents, I'm not terribly bothered about the low wages we're paid. I generally make a livable wage, and the unofficial benefits of my job are enormous. Indeed, many of my friends who make 4x more at great companies would be envious of the daily freedom, travel abilities, and satisfaction that comes with getting a PhD. 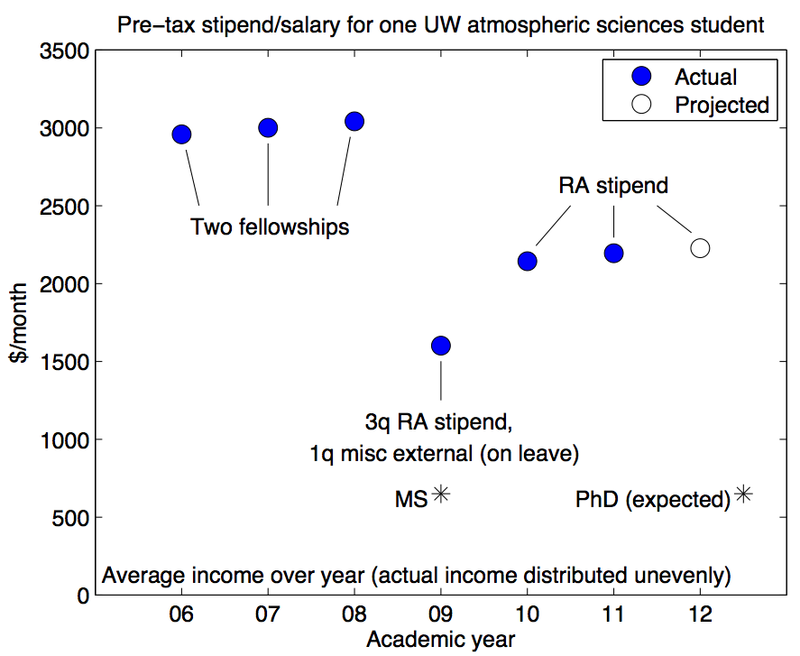 To be fair though, wee regularly hear from incoming grad students that UW has the lowest offer of pay from any institution they were accepted to. Ouch. But there's something absurd about having to give such a huge portion of my living stipend back for "fees". 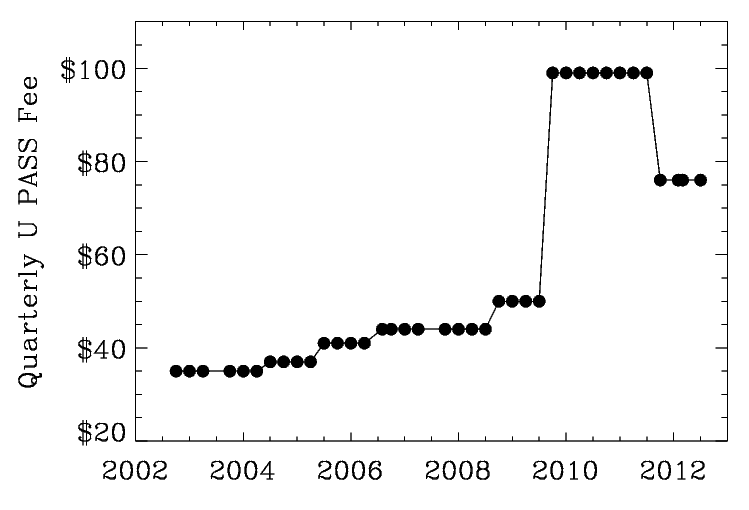 I don't have data on hand about the history of fees at UW, or the cost of living in seattle (though I can say that rent is at least double what it was when I first moved here). I'd love if someone could point me to such data, though! 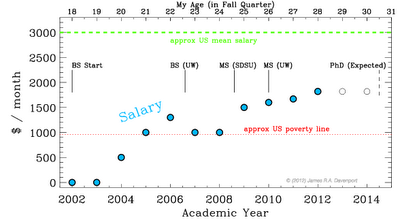 To facilitate some discussion, here is the history of my salary. 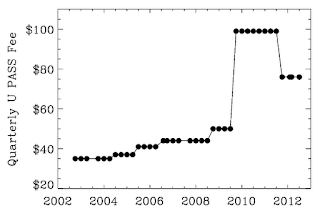 Note these are not adjusted wages, just raw numbers. Despite having a small stack of college degrees, the earning profile in academia doesn't exactly resemble what I'd expect to make in industry - and thats OK! This figure is incredibly personal in some sense. Many people judge their worth on their income, and discussing your income (or asking others about it) is very taboo, for reasons that escape me. Maybe I'm more comfortable talking about it because I don't have any money. I seriously invite some discussion on the subject. Got any data on typical earning profiles as a function of age in industry? 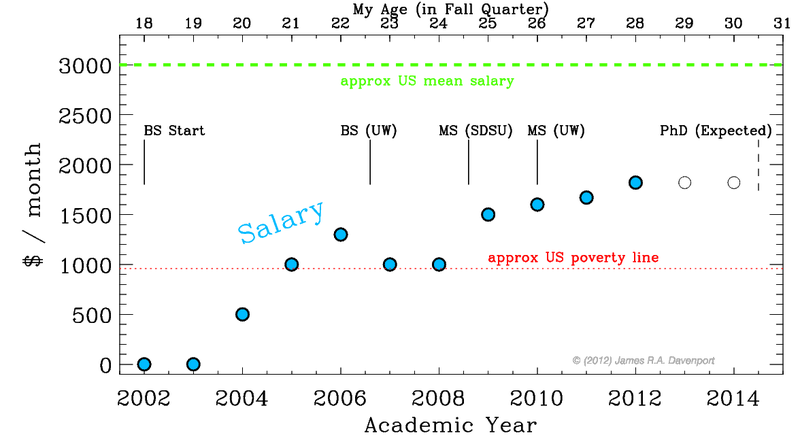 Can you point me to some cost of living data, or history of fees/tuition at UW (or other schools)? Try this one on for "conflict of interest"... the CEO/president of my masters program suddenly "has always had" the responsibility to approve or deny transfer credit. He started denying my pre-approved transfers from UCLA and now I'm paying out for non-native instructors to stumble through slideshows on medical courses such as Neurophysiology. The difference in costs is upwards of $4000. The difference in quality is priceless.